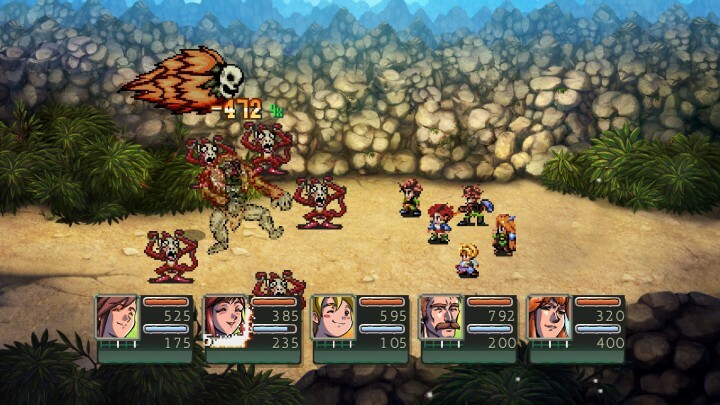 Pier Solar and the Great Architects came to be when an indie studio called WaterMelon wanted to create a brand new RPG for the Sega Genesis – in the year 2010. After releasing a limited quantity of physical game cartridges they successfully crowdfunded an HD version of the game for PC. 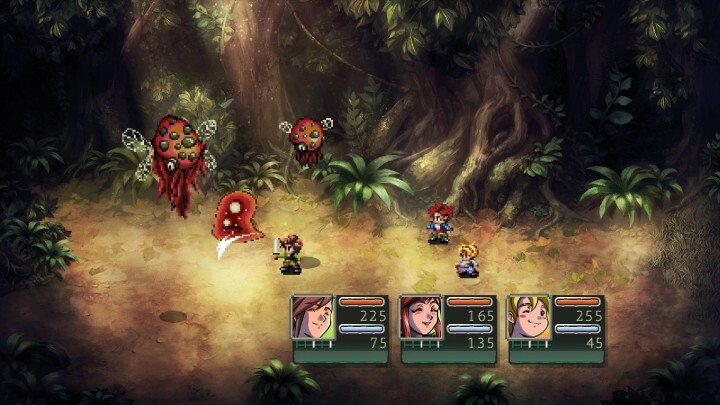 It’s evident throughout Pier Solar that much love was given to recreate the magic of 16-bit JRPGs, with influences from classics such as Lunar and the Phantasy Star series. The background art is gorgeous, the sprite work is detailed, and the soundtrack is wonderfully nostalgic. However, once this magic wears off the game’s unrefined aspects become glaringly obvious. With unbalanced and tedious gameplay wrapped around inconsistent plot and characters, reaching those precious glimpses back into the 16-bit golden age is frequently an uphill struggle. Pier Solar opens up like any typical RPG — you’re in your house and presented with a simple quest that will inevitably draw you into a world-threatening conflict. 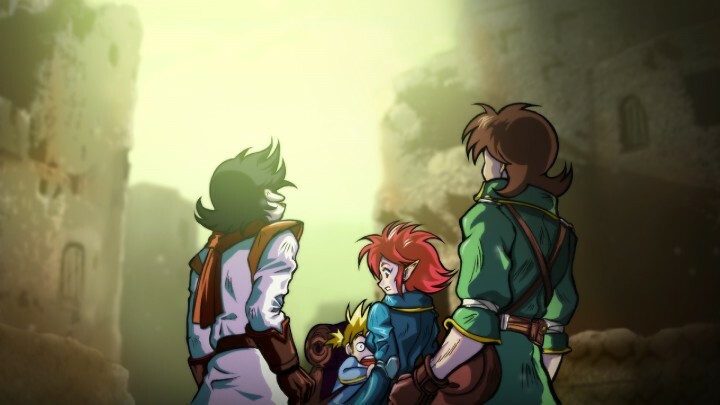 There are plenty of other cliches drawn from anime and RPGs of the 90s as you meet your first party members, but that’s to be expected. Alina is the spunky no-nonsense healer with a good heart (see Jessica from Lunar). Edessot is the young genius inventor who is mature beyond his years (see Lucca from Chrono Trigger). The protagonist Hoston fits the hero archetype to a T. But the game soon presents a spark of curiosity right after the first dungeon, with promises of an ancient civilization and conspiracies to be uncovered. It’s also hard not to be enamored by the game’s vibrant background artwork and catchy soundtrack, both in and out of battle. So you soldier on through, even though a few inconveniences already start rearing their heads. 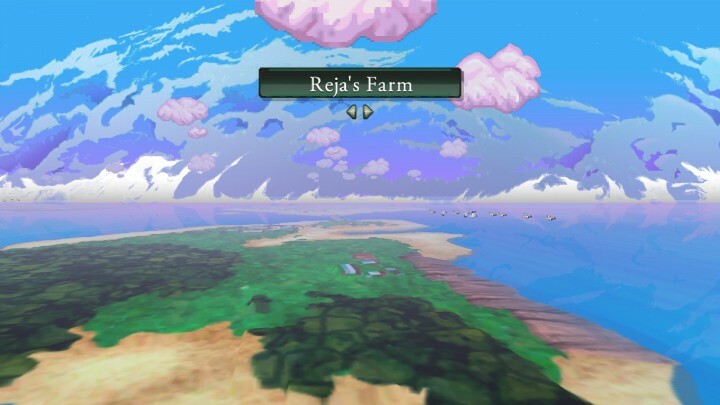 Pier Solar‘s battle system and level design don’t make the best first impression. Combat is overly simplistic, with nothing much to do other than select attack turn after turn. There’s a very slight bit of decision making involved when faced with ground and aerial enemies, but it’s nothing more than a nuisance when it equates to just selecting what to attack with who. The game’s unique feature, the gather system, is also not introduced well. While this is still very early on in the game, there have been many other RPGs that have elegantly presented starting mechanics to make gameplay instantly fun. As for navigating around, there are doors which blend in near perfectly with the black background of some areas, making path finding a trial and error process. However, there are a few modern features that elevate the game’s enjoyment, namely auto-save, a mini-map, and a treasure radar. The journey is just getting going though, so you’ll want to explore further and hopefully open up the experience. Pier Solar‘s nostalgia buffer has worn out, and the full extent of its flaws are exposed after just a few hours of play. Progressing through the game becomes a chore with aggravating missteps in combat, interface, and map design. It’s often not clear where to go next, with vague mentions of a general landmark or area being your only guide. There’s a point where you’re simply told to “go west”, but the only method of doing so is to traverse a previous forest area that had a section blocked off. Even if you were to understand immediately that the forest was the only access to “go west”, it’s unintuitive to think that the once-inaccessible section is now open without any hints. While there’s no need for a flashing objective marker, a simple dialog between party members mentioning that the debris might be cleared would have helped immensely. The game also often hides the path forward behind background objects, making you guess which direction to go. 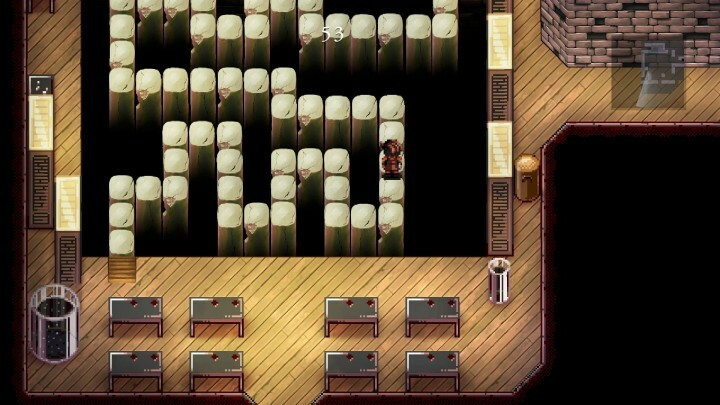 It feels like a contrived attempt at providing cheap “puzzle” elements to the dungeon crawl. When you’re standing around for a full minute just entering menus and watching the heal spell between encounters, Pier Solar feels like a bad grind. After dozens of random encounters (another archaic design choice that is thankfully removed from modern games), several sticking points are noted. The game leans on the importance of elemental attributes, but there’s no way to analyze an enemy to discover their weakness. Trial and error of repeatedly getting hit and noting which accessory you have equipped is the only method to deduce this information. There’s also no way of knowing if an enemy is in a defensive stance which likely results in your party being countered by surprise. In addition to these issues, the gather system is finally gaining some traction in a bad way. The basic principle is more gather equals more damage multiplier, up to four times at maximum gather. However the result is that you usually spend at least one turn doing nothing but gathering, then another turn sending all gather points to one party member to unleash a one-hit KO spell. This trivializes battle strategy as there is no longer a need to consider elemental attributes or ground vs aerial enemy types. Four times damage is more than enough to eliminate any enemy formation. What’s worse is that getting hit by an enemy reduces your gather points, so if you end up getting hit consecutively the spell will go off with greatly reduced power. This means more turns spent cleaning up and taking damage. The kicker is that spell animations are egregiously lengthy, taking several seconds just to go off even out of battle. When you’re standing around for a full minute just entering menus and watching the heal spell between encounters, Pier Solar feels like a bad grind. Regardless of these numerous faults, the plot is just intriguing enough to motivate you towards the next goal. There’s a secret society, hidden agendas, and the mysteries of unknown artifacts. Characters begin to slowly peel away layers of their past. It’s nothing ground breaking, but the setup is just barely promising enough for a slog through the next few areas. Around halfway through Pier Solar, several key milestones are reached that greatly enhance the enjoyment of both the plot and gameplay. The first big reveal occurs, taking you beyond the mundane mountains and forests into an unknown land across the ocean. 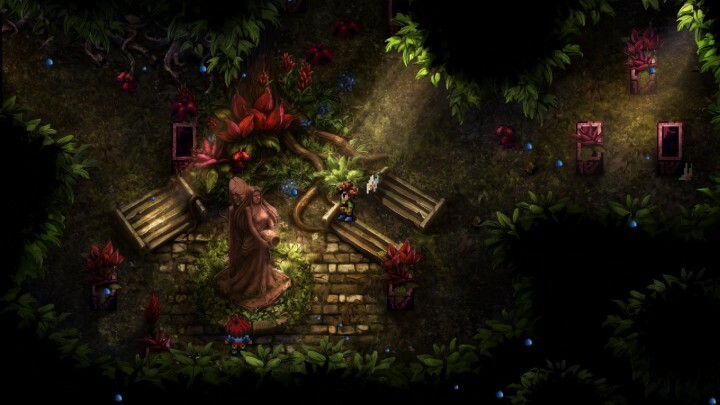 New characters are met and mysteries introduced, weaving in a little more complexity than the fairly linear objectives of the first half of the game. A new party member is added to your rag tag crew, injecting a little more flavor to group conversations (which previously revolved almost solely on how to reach the next location). Quirks and personalities among NPCs seem to be much more varied in the new towns, which are themselves constructed with much greater detail and charm. This is contrasted with the rest-stop-like existence of the villages that have come before. From the seedy bandit port town of Assac to the sprawling industrial capital of Verahansha, the world finally feels more lived-in. The pacing just feels better, and you can focus more on the fun. Along with improvements in world building comes some much needed depth and balance to the battle system. Gathering is at last a strategy that goes beyond a two turn all-or-nothing approach. Boss battles require you to pay more attention to your gather points pool, passing it back and forth between party members as needed for big heals or damage output. New spells are added that require different amounts of gather which have effects outside of simply hitting harder. Enemy groups are no longer easily wiped by a cheap gather spell and require a little more thought on how to prioritize their elimination. Some can summon help, some do party-wide damage, and some can become untargetable. While this can still be frustrating, the thing that ties it all together is the access to the elemental accessory shop. This shop sells 50% damage reduction accessories for all elements. Stock up on five of each and it’s practically 50% more defense for the rest of the game, since enemies in any given area only have one elemental type. Instead of being game breaking, it feels more fair and almost intended as the incoming damage seems more reasonable. This also results in less healing out of battle, which means less time spent fumbling through menus and sitting through animations. The pacing just feels better, and you can focus more on the fun. It’s unfortunate that the final hours of Pier Solar end on a dull note instead of building on the momentum it gained at its midpoint. Some questionable game design choices sour what could have been an otherwise satisfying closing chapter to this RPG. One such offender is the slippery tiles mini-game. On PC using a keyboard the input lag was horrendous, requiring you to press and hold a key a half second before you actually reached the turn. Quick taps don’t register and you’ll often guess the timing of your next action due to the lag, causing failure after failure. This wouldn’t have been too bad if the mini-game was optional, but it’s required to get through three of these in a row before being allowed to progress the story. It’s not difficult to imagine that some people may give up on the game here in frustration. There’s also the strangely unrewarding access to world map travel. You’re limited to only a small handful of locations, with some towns completely unavailable via this travel method. You’ll have to literally backtrack through the game’s enemy-infested areas to reach them in order to get to some side quests and hidden treasures. It’s like getting an airship that can only make designated stops. There’s no sense of freedom to it, and you’re discouraged from wanting to explore previous areas. The plot itself unravels into a convoluted mess, throwing in plot twist after plot twist until they no longer feel shocking. By the end, you don’t feel shocked at yet another reveal but apathetic. The characters themselves, both protagonists and antagonists, never get developed beyond what’s shown in the second half. In fact some even seem to grow a separate personality as their reactions to some events are inconsistent with who they just were a plot point ago. There was a lot of potential, but unfortunately only a small amount of it was realized. However, the final act isn’t terrible by any means. The last few areas are fun to explore, with the final dungeon having some of the nicest background artwork in the entire game. Getting the best weapons and items does actually make you feel very powerful, but not over-powered (e.g. Final Fantasy games). The game gives you time to enjoy your new toys without making them feel pointless. The biggest contributor to making the end game fun though might be the item Yoga Sutra, found in an unassuming bookshelf. It’s a shame that this item can be missed, since it’s so important to freeing up the battle system that it’s difficult to imagine finishing the game without it. What it does is give all party members one gather point at the start of every battle. This means everyone gets a free starting 1.5x damage boost and powerful gather abilities can be used on the first turn. This really helps to make battles feel less tedious by opening up options and reducing the initial gathering time. It’s a reminder that modern games have learned how to improve on their 16-bit ancestors. Pier Solar is a game with a lot of what ifs. It’s inconsistent in its design throughout, feeling like a sketchpad of ideas that could have been so much more with better focus. What if the plot was simpler and had characters who were easier to relate to? What if the gameplay was tightened so that the challenge curve felt rewarding? Instead you’ll just have to take the good with the bad if you want to eke out the bits of fun that do exist. 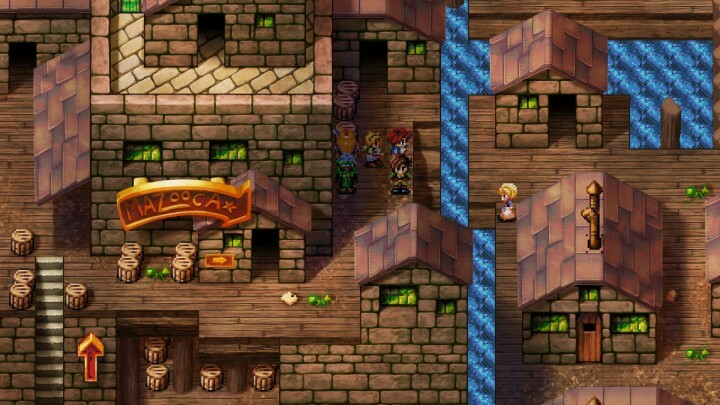 When it works, the golden age of 16-bit RPGs is brought into modern times. But, it’s also a reminder that modern games have learned how to improve on their 16-bit ancestors.